So I guess you guys really like chocolate, since you went mad for my salted chocolate pots with caramel sauce the other day. Duly noted – more chocolate coming up. I’m afraid today’s recipe isn’t quite as exciting as butter + chocolate + cream, but in my corn-loving opinion, it’s just as delicious – garlic butter sautéed corn! I sometimes struggle a bit with side dishes, especially when I’m having friends over to eat. I don’t want to make anything too fancy – partly because it’s nice to keep the focus on the main event of the meal rather than the side dishes, and partly because I can’t be bothered making anything too time-consuming when I have schmoozing to do. However, it also feels like a bit of a cop-out to do something totally simple like plain old steamed vegetables. People can have steamed vegetables at home every night of the week, so it’s nice to do something a little different that your guests might not have tried before. Enter: sautéed corn. Simple yet interesting, and ridiculously tasty. 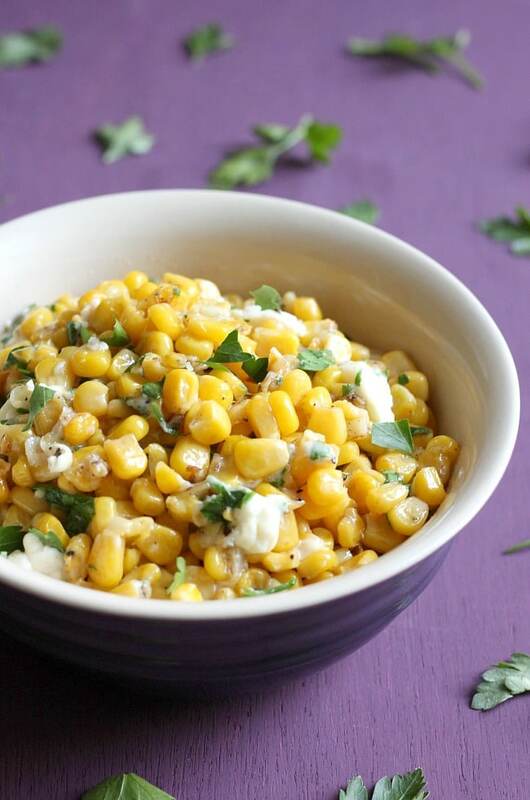 When it’s sautéed, the corn gets an awesome nutty flavour. 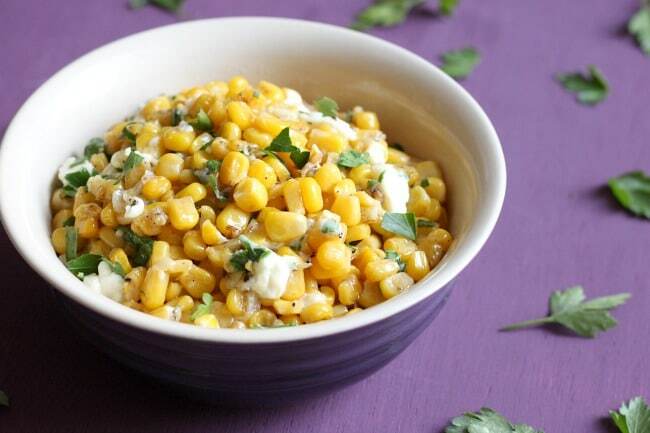 You can throw this dish together in a matter of minutes – just add your corn to a pan with some butter and loads of garlic, and then toss it with some parsley and a little bit of feta cheese. Yeeeees, feta! 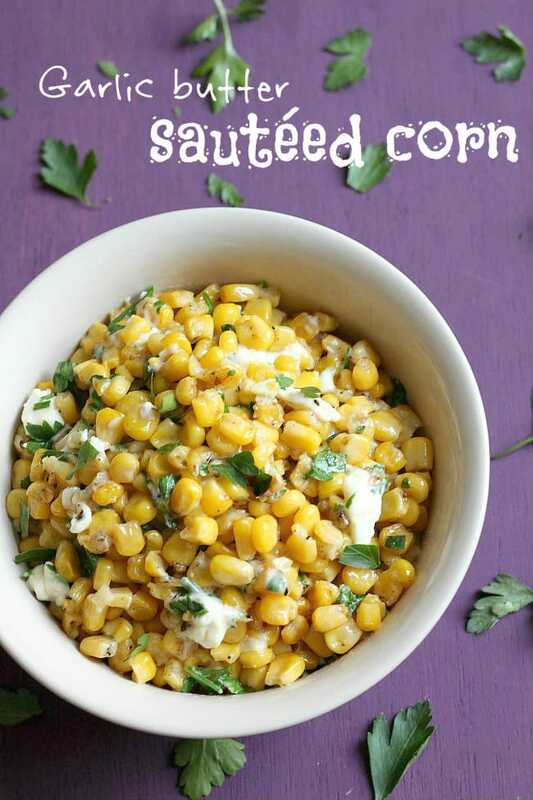 It goes lovely and gooey, melting right into the garlicky, buttery corn. If everyone has a normal-sized heap of corn, this recipe will probably serve about 3 people, but I’d probably aim for it to only serve 2, since I guarantee that most people will want seconds. And thirds, and fourths, and maybe just a little bit more. What’s your favourite side dish to serve for guests? 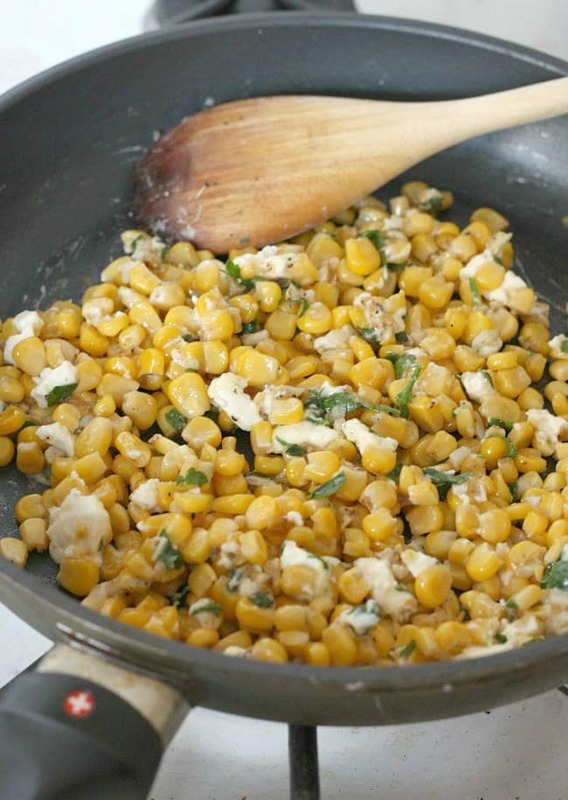 Melt the butter in a frying pan, and add the garlic and corn. Cook over a medium heat, stirring every minute or so, for around 5 minutes. Remove from the heat and add the parsley and feta cheese, then season to taste. Fan of corn? 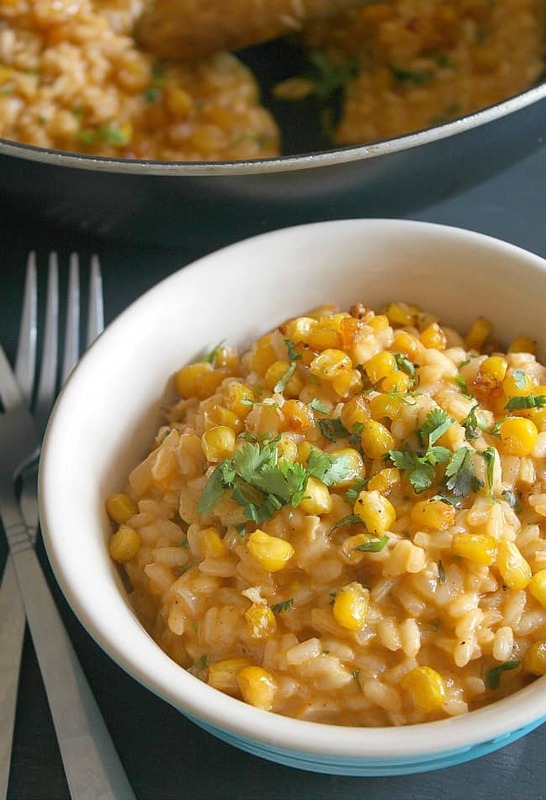 Try my roasted corn risotto with smoked paprika! Why have I never thought of this before?! Why have I just been boiling my sweetcorn like a moron!? You guys have been busy :D so glad you liked this one too! Oh my goodness… this sounds SO GOOD! I want a huge bowl of this for dinner tonight. corn is ok, not a huge fan, but this makes me want to eat buckets of it! This actually sounds like exactly what I’ve been craving lately, but hadn’t been able to put my finger on it! Yum (and thanks)! Oh man, now I am craving the new summer corn crop! Too bad it’ll be at least three months before that happens. :P I bet this would be especially good alongside a huge barbecued portobello burger. 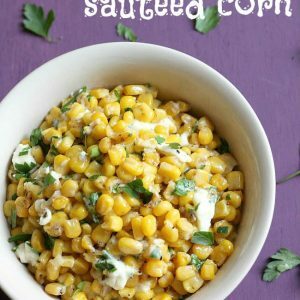 This recipe makes me very impatient for summer and sweet corn fresh from a farm stand. I’ll definitely be trying it before that time comes though, it looks so good! Anything with garlic is a winning recipe in my book. And corn, and cheese? Mmmm, yes. Pinned it for later.